RECIPE OF THE DAY ! Eat Healthy , Live Healthy !!! A quality coconut is heavy for its size. When shaken, the liquid inside will slosh around. 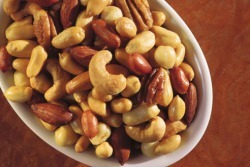 A nut without liquid indicates spoilage as well as moldy or wet eyes. The water of the coconut is notthe milk. The coconut is an essential food in "The Dries Cancer Diet"